Having joined theTouring Car Masters grid less than a year ago, young gun Michael ‘Magic Mike’Almond has certainly made a name for himself in the hard fought series ofclassics. Running father Ross’Porsche, the Almonds have been running their Copyworld Racing outfit not onlyin the Masters, but also in Porsche GT3 Cup Challenge and Australian GT,reaping success in each series they take on. Now, the younger ofthe Almonds is looking for success with the Masters once more as he makes hisracing debut at Barbagallo Raceway this weekend. On Masters debut atHidden Valley Raceway in 2012, Almond immediately became one to watch as he postedtimes over two seconds faster than his fellow Porsche entrants. His talent hascontinued to stand out with multiple podium places in Class B last season,before his efforts warranted a move into the Outright standings of Class A atthe start of 2013. Round One saw Almond take his #26 Copyworld Porsche securelyinto the top 10 for the round, with an outright top five race result already inthe bank. It’s clear there’smuch more to come from this young South Australian, and he prepares for hisnext challenge, making his debut at Barbagallo Raceway under the watchful eyesof Australia’s most influential motor sport fraternity, Almond is ready to takeon the Masters field once more. “I’m hoping tocontinue my learning curve as a race car driver and check off another circuitthat I’ll have to get to know pretty quickly to stay competitive,” Almond said. The Masters’ lastvisit to Perth saw fellow Porsche racers Greg Keene and Amanda Sparks have theclosest (unofficial) finish between a husband and wife racing the same car inthe same series at the same time, crossing the line a mere 0.003 seconds apart. This year, Almondseeks to make his own history. Given Almond’ssuccess in Porsche racing already, notably his recent round win in the PorscheGT3 Cup Challenge, what does he think of returning to the classic muscle cargrid in Class A against some of his racing heroes? “Mallala was afantastic result for the Copyworld Racing Team," Almond said. "I felt very comfortable in thecar over the weekend and I think it showed in my driving, particularly the wetrace, which was a surprise to me, as I struggled early last year when competingin the rain. Armed with a reliableand top performing Porsche, a want to continually improve, and the knowledgemotorsport can change in a heartbeat, Almond admits the pressure to achievecomes from himself at a healthy level to push forward. With absolute supportfrom his Copyworld Racing crew, his family and ex-Masters racing father Ross,and it has become clear the young racer is on the radars of many enthusiastsand racers alike. 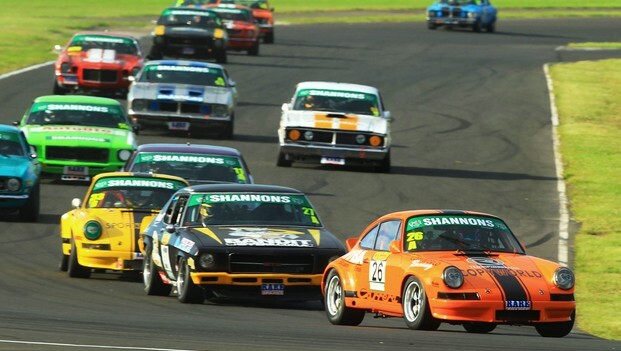 The Touring CarMasters is proudly supported by Shannons Insurance, Rare Spares, Unique CarsMagazine and the 2013 Australian Muscle Car Masters, with official suppliersHoosier Tires and Australian Sports Marketing, and official technology partnersSandman Technical.